The Corsair Obsidian 1000D is, hands down, one of the biggest and baddest PC cases to come out in recent years. With room for two complete systems, up to five graphics cards, two 480mm radiators in front and another 420mm up top, there’s no other chassis on the market that can hold more components. Aside from being a monster case in size and capacity, Corsair employed a bunch of new features with its latest Obsidian case, including liquid-cooling drawers and French doors to hide all the PC power cables – and even six SSD trays. The only thing more impressive than everything the Corsair Obsidian 1000D can hold is its extensive, two-year product development cycle. Luckily, we got to hear all about the super tower straight from Aaron Neal, Corsair‘s Manager of Worldwide Product Marketing for DIY Components. At its core, Neal says the Obsidian 1000D was always about custom cooling. Whether that meant dual or triple custom loop systems or ultra-thick radiators, Neal wants to give users the opportunity to do everything they dreamed of. “Basically, it's what you can do if you try to make a custom case, but without having to make a custom case,” Neal says. That said, Neal also made sure the Corsair team didn’t let themselves get too crazy and make the Obsidian 1000D too large. Thankfully, Corsair also made attaching all those aforementioned radiators with telescoping radiator trays that come out of the case. However, to support all that weight, Neal’s team couldn’t just go with a basic sheet of metal – they had to develop a new slide out mechanism similar to that of a desk drawer. Still, Neal is confident that Corsair’s telescoping radiator trays can take the weight. 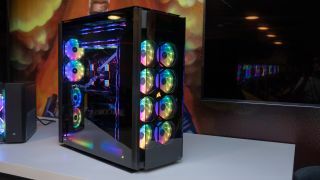 The Corsair Obsidian 1000D most striking design characteristic – again apart from its sheer size – is that it features tempered glass on almost every side. Although tempered glass hasn’t had the best track record for airflow, Neal tells us that Corsair engineered the problem out by thoroughly testing airflow with a wind tunnel machine. However, Neal argues you simply need to leave a gap between the intake fans and the 1000D’s front tempered glass panel. Corsair’s wind tunnel machine is the very same one we saw during our tour at the company’s headquarters, and it’s pretty much a cylindrical tube with a wind meter in the back. Of course, just because the Corsair Obsidian 1000D was a smashing triumph doesn’t mean Neal and his team are done with innovating on PC cases.